How do you convert PDF to DWG document? Do you need to convert the graphic in your PDF to DWG of AutoCAD? If so, please use the GUI application VeryPDF PDF to DWG Converter which supports to convert PDF document to AutoCAD files like DWG or DXF. In addition, the application supplies several kinds of conversion modes and spline modes. In this article, you will see how to use this application to make the conversion you need. 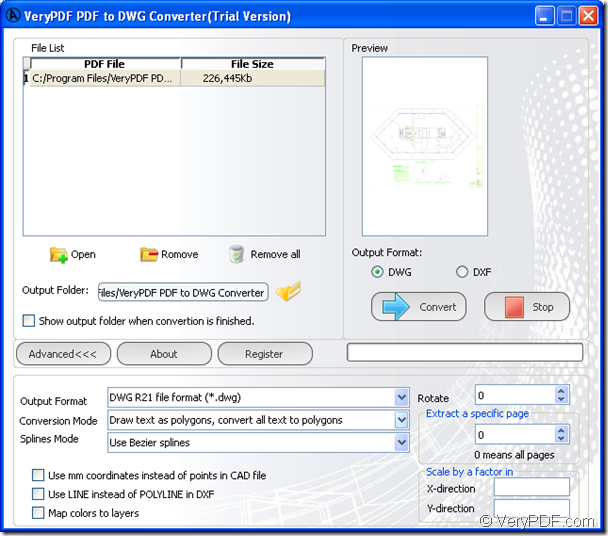 Please free download VeryPDF PDF to DWG Converter and set up it on the computer by following the installation steps. For your use convenience, you can create a desktop icon for the application so that you can directly double click it to open the application. Of course, you can also open the application through Start menu. Please see the user interface of the application in following snapshot. When you add PDF document into it, please click Open button and choose PDF from the opened file picker window. If you want to delete the added PDF, you can use the button Remove or Remove All. In Output Folder edit box, you can edit the destination for target file. When you click any added PDF document, you can see its preview in Preview panel. If you want to convert PDF document, please check the option DWG below preview panel. To select the output file version, please click Advance button and choose a suitable one in Output Format dropdown list. In Conversion Mode dropdown list, there are three kinds of conversion modes for your choice and you can also choose a spline mode in Splines Mode dropdown list. After setting all parameters, please click Convert button to run the conversion from PDF document to DWG and you just need to wait for several seconds before checking the target file in output location. If you want to have a try of this application, please free download VeryPDF PDF to DWG Converter. In addition, you can also enter the homepage of VeryPDF PDF to DWG Converter to get more useful information. This entry was posted in PDF to DWG Converter and tagged PDF to DWG. Bookmark the permalink.